People will be travelling around the world over the next week or so to celebrate the start of the Year of the Pig. Welcome to the Lunar New Year of 2019! Smith Stone Walters wishes you a healthy, successful and prosperous year ahead. Spring Festival or Chinese New Year will begin in 2019 on February 5th (Tuesday). It is a time when families from all over the world reunite. It is expected in China alone people will take three billion trips over the next two weeks, with 73 million plane journeys. This figure has increased by 12 per cent from last year. 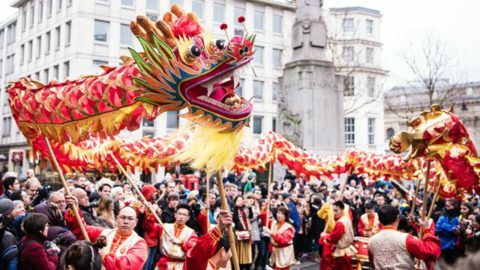 Flights from China to the UK are up 24% from the date of the last Chinese New Year. The start of the Year of the Pig will be celebrated in most major cities including London and Manchester’s Chinatowns, as well as in Birmingham, Liverpool and Leeds. For the first time there will be a Chinese New Year festival in Edinburgh. VisitBritain, the tourist website, estimates that the UK will see 483,000 visits from Chinese tourists this year, up nearly 50% from 2017. Chinese immigration – to work or study here for a longer term – is rising. The latest figures from the Office of National Statistics show that the UK issued 520,000 visas to Chinese nationals last year. They make up the biggest group by country, accounting for a quarter of all visit visas. In a bid to encourage more foreign tourism and business, many Chinese cities have introduced a 72-hour visa-free policy for visitors. They include Beijing, Shanghai and Xian. In 2018, Chinese immigration control reported that they processed 651 million travel document inspections last year, with an (impressive by Home Office standards!) average time of less than 45 seconds. Smith Stone Walters 恭祝您新的一年身体健康 万事顺意!